Spreading the tax burden equitably, investing wisely and spending prudently. These are three things in the history of the 26-County state that no government has managed to do. They are though the core themes of the Sinn Féin Emergency budget submission launched this week. A fair approach to revenue raising and a positive strategy to ending government waste through carefully thought through cost saving proposals are the key pillars of the Sinn Féin document. 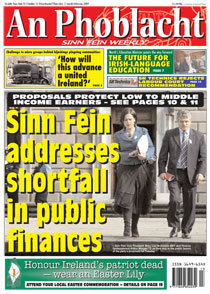 This week An Phoblacht summarises some of the key proposals in the Sinn Féin policy. As Fianna Fáil finance minister Brian Lenihan sat down after delivering his first budget speech last October, it was clear to many political and economic analysts that the September budget called early amid a constant background of coalition government hype was a stop gap and we would be back within months with a Budget 2009 mark II. And so here we are. There has also never been a year where Fianna Fáil or any establishment government have been accurately able to forecast the tax revenue they expected to gather in to pay for government spending. 2009 is no different. There has also never been a government with the political will to ensure money is spent prudently and effectively. 2009 is no different. Sinn Féin believes that Fianna Fáil and the Green Party’s handling of the public finances is putting economic recovery at risk. Instead of bringing forward a framework and strategy for growth they have introduced a set of non-aligned short-term initiatives, many of which are counterproductive, for example, the increase in VAT. The government has confused accountancy with economics. They should have put more money aside in the boom and put more of the available resources into long-term priority projects. Instead it wasted much of the state’s money on non-productive schemes such as property incentives, fuelling and prolonging the property bubble. Now we have the same thinking in reverse. They will exacerbate the recession by over taxing and spending cuts, rather than stimulating the economy. The Sinn Féin submission stresses that they were “the only party that did not promise tax cuts in the last election because it was the right thing to do to protect the economy” and is now “putting forward solutions to fix the economy that are based on sound economic proposals”. In the core factors driving Sinn Féin's approach to the emergency budget there were two key untouchables. They were that those earning the minimum wage must be kept out of the tax net and that social welfare payments cannot be cut. Sinn Féin are opposed to selling off profitable state companies, or firms that could be made profitable again as this is counter productive for future economic development. The only way to secure the economic future is to retain existing jobs and to create new ones; to create a fair and progressive taxation system and better regulate the financial sector. This emergency budget must include measures to start stimulating as well as stabilising the economy. Sinn Féin believes that their submission contains, “the fairest and effective recovery proposals”. In the document Sinn Féin sets out proposals to raise an additional €3 billion in tax revenue and savings in 2009 and almost €5 billion in a full year. They are also calling for borrowing to be increased to 10.5% which would raise €2 billion this year. This borrowing must be for strategic investment and used to avert further contraction of the economy. Reducing travel subsistence across government departments. In the past when the public finances have been under pressure, Fianna Fáil and Fine Gael-led governments have implemented policies targeting the low-to-middle income PAYE worker. They are doing the same thing again today. People are willing to contribute to rebuild the state, but they are unwilling to shoulder the lion’s share of the burden to repair a mess they did not create, particularly when they have no confidence in what their taxes are being used for. The dramatic contraction in the economy indicates a genuine emergency, the treatment of which has to take precedence over all other concerns, including debt accumulation. The government did nothing over the last ten years to broaden the tax base on a progressive basis and as a result, as the construction and retail sectors began to depress, public finances went into freefall. The government has stated that it needs to raise €4.7 billion to meet budgetary targets, but this figure is only an estimate based on current receipt projections, which have been consistently wrong. In January and February, the state collected €2.2 billion in VAT, down from €2.6 billion in the same period last year, despite the government’s 5% increase. Stamp duty take fell by 50% in 2008 to €1.6 billion. In January and February only €153 million was collected. 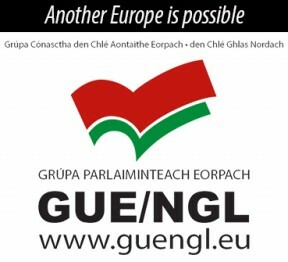 1,447 people, 0.06% of all earners, earned approximately €3.459 billion between them in 2008. The latest figures available show that more than 25% of the top 400 earners paid tax at a rate of less than 20%. As at 31 March 2008, the amount of outstanding tax due to the state was €1.286 billion. According to the revenue commissioner’s report, almost 25% of that was not available for collection. The revenue must be given additional resources to pursue outstanding taxes and close down loopholes and tax evasion measures. These resources must target on a priority basis those evaders and defrauders at the top of the food chain, most able to pay. Treating in-patients in private hospitals costs the taxpayer €850 more per patient than in public hospitals. With 20,000 in-patients being treated through the National Treatment Purchase Fund, private hospitals are pocketing €17 million of taxpayers’ money each year. Between 2002 and 2008 €230 million was claimed in expenses by civil servants operating across state departments. The following are our proposals, as costed by the Department of Finance, to deal with the budget deficit. Our figures, where possible, cover the rest of 2009 and a full year. In several instances, the Department failed to provide estimates for the remainder of 2009, and where this occurs, we have indicated our own estimated figures. Nationalise the wholesale distribution of subsidised drugs and compel medical practitioners to prescribe low cost generic drugs – 2009 – €100 million. Full year – €200 million. Prohibit former and current legislators and senior civil servants from holding more than one public pension - Government unable to provide answer. Increase the charges to private hospital beds by 83%, – 2009 €300 million.